Will Chrissie decide to have her abortion? Broadcast on Channel 5 (UK) 17 June 1997 Tues 4:40 a.m.
Erica removes Chrissie from working in the maternity wing, after she insists on going ahead with the abortion. Vera reports Pat for "consorting" with her own son, but Pat refuses to say how she knew that David was coming to Wentworth. Back in the rec room, Bea is about to land one on Chrissie for lagging on Pat, until Pat stops her. Jim reports that it must have been Doreen who gave the information to Pat, but Erica decides to take no action. She also agrees to Jim's suggestion that Pat should only be given extra work duties and that the incident with David should not be officially reported. Erica inspects the halfway house and tells Karen that Doreen will be released the following afternoon. Vera complains to Jim about Pat being let off so lightly and is surprised when she finds out whose idea it was. Chrissie tells Greg she's changed her mind and doesn't want the abortion after all. Alice visits the halfway house and Karen tells her she should keep out of Doreen's life unless she's prepared to be a proper mother to her. 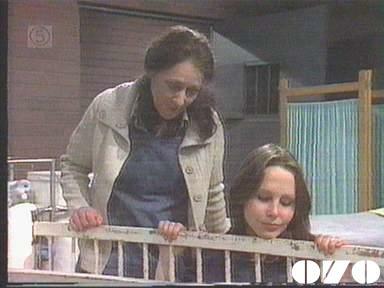 Meg tells Doreen to collect her things as she's to be released in half an hour. During the tearful farewells, Doreen nearly forgets to take Teddy with her. At the halfway house, Doreen finds the freedom difficult to accept and is reluctant to take the key Karen gives her. Greg takes Karen out for a drink and warns her against emotional involvement with people at the halfway house. Alice takes Doreen for a drive: she asks to go and see Miss McBride, but the new owner of her house tells Doreen that Miss McBride died a few months before. Rosie asks Pat to get some extra things from the kitchen for her baby Sam's first birthday party . Doreen tells Alice she had a baby herself, but gave it up for adoption: when Alice offers to help her trace the child, Doreen tells her she isn't interested. Lizzie explains to Pat that Sam will be taken away from Rosie when he is one year old: Erica gives Vera the job of arranging the foster parents. Alice shares a secret with Karen, which explains why she wanted to see Doreen, but did not want to get too involved - she has terminal cancer.